Low carb vegetables are packed with phyto-nutrients, vitamins, and minerals that make dieting a healthy choice. Low-carb diets encourage the consumption of vegetables such as radishes, leafy green vegetables, cabbage, and celery. The only veggies to be avoided are starchy ones like peas, beets, and corn. Leafy green vegetables have a high nutritional value and provide phyto-nutrients such as lutein and beta-carotene. They are packed with vitamins and minerals, including vitamin E and C, calcium, and potassium. Greens are an excellent source of vitamin K, which offers protection against liver and lung cancer, dementia and other brain disorders, cardiovascular disease, osteoporosis, and arterial calcification. In the view of Dr. Cees Vermeer, a biochemist and one of the leading vitamin K researchers, most people have vitamin K deficiency. Leafy green vegetables provide large amounts of vitamin K and contain little carbohydrate. Celery is a popular low-carb vegetable to use in snacks and meals. There are plenty of tasty snacks to prepare such as celery and tuna salad, celery soup, and mashed celery root. This vegetable contains vitamin K, C, and A, potassium, and fiber. Celery is a hydrating food rich in essential oils and plant hormones which have a calming effect on the nervous system. It contains compounds and substances that stop the growth of tumors and prevent cancerous cells from multiplying and spreading. Minerals in celery, including potassium, magnesium, and calcium, help maintain normal blood pressure. It has anti-inflammatory properties, helps the body to eliminate toxins, and boosts the immune system. Cabbage is low in carbohydrates and contains vitamin K, vitamin C, and cancer-preventing substances. Cabbage activates certain enzymes that help prevent colon, breast, and lung cancer. This vegetable contains cholesterol-lowering compounds and is an excellent source of sinigrin. Different research studies have demonstrated that sinigrin can prevent prostate, colon, and bladder cancer. Celery helps eliminate toxins and aids the proper functioning of the kidneys. It reduces the risk of developing gall bladder stones and alleviates the symptoms of bronchitis, osteoarthritis, and other inflammations. Celery is also a great choice as it curbs cravings for foods rich in carbohydrates and sugar. Avocado is a popular vegetable that most low carb diets recommend. Avocados contain large amounts of monounsaturated fat and nutrients and vitamins such as pantotheinic acid, vitamin K and C, and riboflavin. Avocado oil is an excellent addition to salads because it contains monounsaturated fat. It helps the absorption of beta-carotene, lycopene, and other antioxidants contained in vegetables. There are even more health benefits to eating avocado on a low carb diet. Various studies have shown that some compounds in avocado help prevent several types of cancer. Oleic acid in avocado stops breast cancer cells from growing. Other compounds help prevent the development of oral cancer and prostate cancer. Glutathione, monounsaturated fats, and vitamin E ensure that your heart is healthy. Avocado is also an excellent source of potassium and soluble fiber. Soluble fiber is an important component of every low carb diet because it makes dieters feel full by slowing down digestion. Soluble fiber helps the body to control blood pressure, reduces cholesterol levels, and relieves constipation, diarrhea, and other bowel problems. 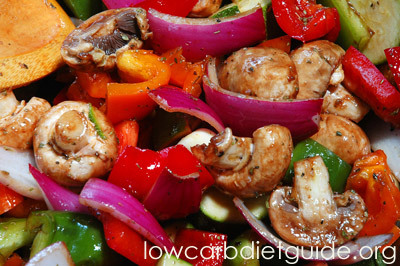 Other popular low-carb vegetables include okra, cucumbers, and radishes. Okra also contains soluble fiber which contributes to healthy weight loss. It is rich in potassium, manganese, and vitamin K. Okra is among the green vegetables with the highest amounts of lutein, xanthin, and other antioxidants. It contains compounds that help neutralize acids and normalize cholesterol and blood sugar levels. It is an excellent food for people suffering from depression and for those who feel exhausted. Cucumbers are also a favorite with low carb dieters because they are low in calories and contain 90 percent water. Cucumbers are rich in vitamin K, thiamine, and folate. Radishes are very low in carbohydrate content and are an excellent source of vitamin C and fiber. They contain important minerals such as zinc and calcium as well as substances with cancer-preventing properties. Popular low carb vegetables such as cabbage, avocado, and okra aid healthy weight loss and contribute to maintaining healthy lifestyle. They are rich in essential minerals and vitamins and protect the body against inflammations, cancer, and other serious medical conditions.